So far, I really have no reason for this page's existence except that I am finally admitting to my like of pop music, and have found a new hobby in playing with Adobe Photoshop. You have to admit, pop princesses and boybanders take good pictures. However, what I will probably do is make occasional updates as to what the various personalities and entities are up to, as well as post reviews of their music and other entertainment endeavours if I ever get around to writing them. Finally wrote my in-depth review of Justin Timberlake's solo album, Justified. It's actually not teenie, and I tried to use some of my scant musical knowledge. 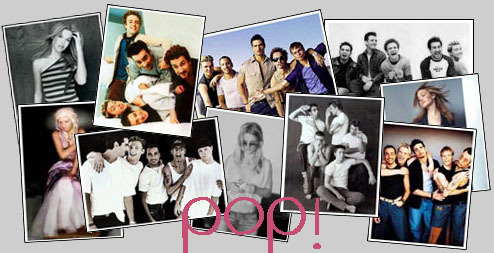 Added first page of content, a countdown of Alarra's Top 9 NSync Pictures. Yes, she's ashamed. But aren't you even a little bit curious? Just a few quick notes on things I missed or forgot in my last update. NSync: Justin hurt his foot again and pulled out of performing on New Year's Eve, but will present at the American Music Awards later this month, as will JC. He is now definitely doing a tour, a smaller then a larger arena tour in the American summer (our winter); this news was broken in a new interview for US Rolling Stone magazine, which features Justin on the front cover. The interview itself is a very disjointed and strange one. He also basically says that Britney cheated on him. The guys have spoken about recording a new NSync album late in 2003. Backstreet Boys: Nick Carter's second single in Australia is, in fact, I Got You, not Do I Have to Cry... as in the States. I think DIHTC is a better song, with a better video. Also, Kevin Richardson is to star as Billy in a new stage production of Chicago. NSync: Justin Timberlake is slowly recovering from his foot problems, and managed to perform a slightly less energetic set at the Billboard Awards. Tickets are selling for a concert in England in March, so there should be a tour, at least in the States, next year. JC Chasez's single underwent a small name change to She's Blowing Me Up and it should be released in the US within the next week. Joey Fatone's run on Broadway in Rent finished a few days ago. The guys were inducted into the US Madame Tussad's with poker-faced wax figures of themselves a week ago, and all five attended the unveiling of their doppelgangers. Backstreet Boys: Nick Carter's second single Do I Have to Cry For You has been released. It is rumoured to be about his now defunct relationship with US pop starlet Willa Ford. Britney Spears: Britney's restaurant, NYLA, ran into so many troubles that she finally admitted that she had no hand in running it, and relinquished ownership of it to avoid being embroiled in its financial mess. She celebrated her 21st birthday in mid-December, with a new book/DVD, Stages, of photographs of her career thus far. Christina Aguilera: Christina's second single from Stripped has been released in the US. Beautiful is said to have a much different sound to Dirrty, as well as being more like the rest of her album. NSync: Justin Timberlake sprained his ankle (at first believed to be a broken foot) and cancelled several promotional appearances. The music video for his new single Cry Me A River, the second from his solo album Justified, was premiered this week. JC Chasez has contributed a solo track, Blowing Me Up (With Her Love), to the soundtrack of an upcoming teen movie about marching bands, Drumline. It will be released as the second single; a video, with an appearance by Tara Reid, has already been filmed. Joey Fatone continues his stint in the Broadway production of Rent until mid-December. Lance Bass, after his position on the October space mission was denied due to lack of payment, completed his training in Russia to become a certified cosmonaut. There are rumours that he will try again for the April 2003 mission. Backstreet Boys: Nick Carter released a solo album Now or Never and is currently still doing promotion for it around the States (second single already/to be released). Brian Littrell and his wife Leighanne welcomed their first son, Baylee Thomas Wylee Littrell, a few days ago. The band has just filed to sue their record company (Zomba, under the label Jive) for $100 million. Their contract stipulated they were to deliver an album by April 2002, but the band maintains that Zomba courted Carter to release a solo album, making it impossible them to record an album as a group and deliver on time. They also allege that they have received no royalties in the years they have been with the company, despite selling millions around the world over three albums. Britney Spears: Has just finished a six month break from music making after a distrastrous year where she saw fans turn on her, her first movie bomb, and her four year relationship with Justin Timberlake finish, possibly quite messily (refer to Timberlake's video for CMAR). A new photobook, Stages, is being released to coincide with her 21st birthday in December. She is currently recording her new album in London, with new collaborators such as Guy Chambers (Robbie William's ex-cowriter). Christina Aguilera: Is enjoying success with her second album Stripped, with her new, more adult, image. Second single about to be released in the States. Information picked up from all over the place.